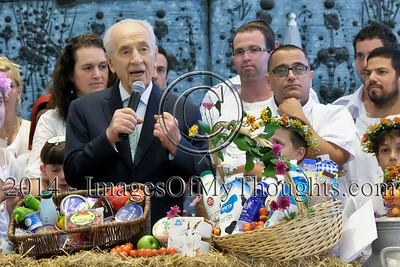 Israeli President SHIMON PERES receives a basket with the best of Israel's dairy products from farmers from across the country. 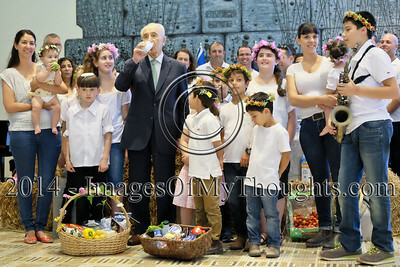 The President hosted a Bikkurim Festival for the Shavuot holiday, celebrating the giving of the Torah at Mt. Sinai. Also referred to as the Harvest Festival, in ancient times Jewish farmers brought their first fruits of the season to the Temple in Jerusalem as offerings. 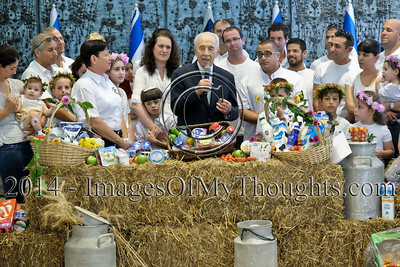 Israeli President Peres receives a basket with the best of Israel's dairy products from farmers from across the country. The President hosted a Bikkurim Festival for the Shavuot holiday, celebrating the giving of the Torah at Mt. Sinai. Also referred to as the Harvest Festival, in ancient times Jewish farmers brought their first fruits of the season to the Temple in Jerusalem as offerings. 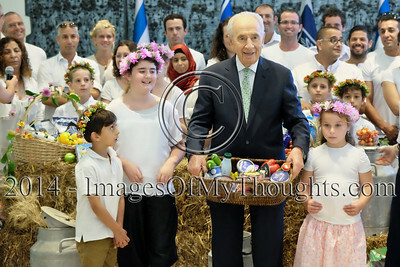 Israeli President SHIMON PERES receives blessings from a young girl for the Shavuot holiday. 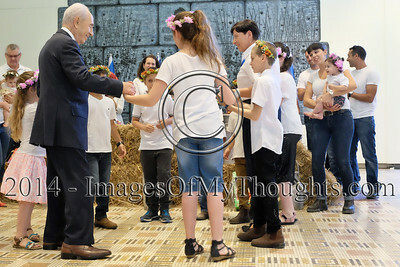 The President hosted a Bikkurim Festival for Shavuot, celebrating the giving of the Torah at Mt. Sinai. 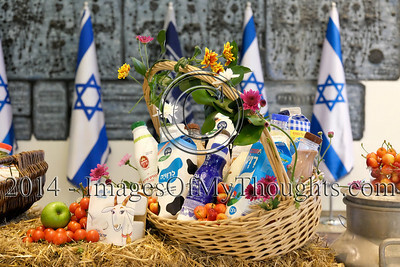 Also referred to as the Harvest Festival, in ancient times Jewish farmers brought their first fruits of the season to the Temple in Jerusalem as offerings. 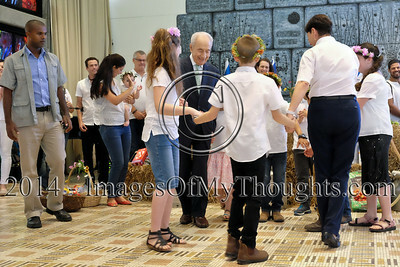 Israeli President SHIMON PERES joins children in a dance circle to the tune of a Shavuot holiday song. 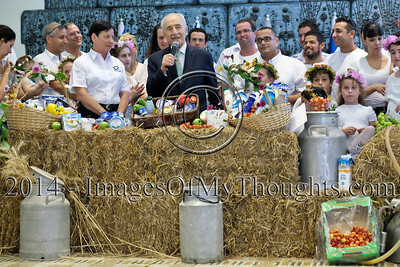 The President hosted a Bikkurim Festival for Shavuot, celebrating the giving of the Torah at Mt. Sinai. Also referred to as the Harvest Festival, in ancient times Jewish farmers brought their first fruits of the season to the Temple in Jerusalem as offerings. 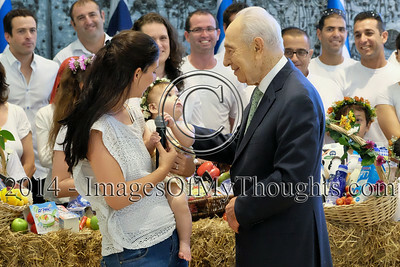 Israeli President SHIMON PERES is presented with a newborn infant in the custom of the kibbutz. The President hosted a Bikkurim Festival for the Shavuot holiday, celebrating the giving of the Torah at Mt. Sinai. Also referred to as the Harvest Festival, in ancient times Jewish farmers brought their first fruits of the season to the Temple in Jerusalem as offerings. 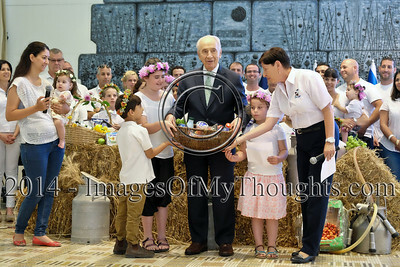 Israeli President Peres receives blessings from a young girl for the Shavuot holiday. 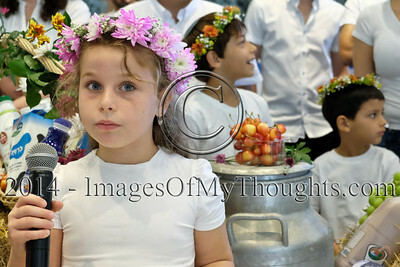 The President hosted a Bikkurim Festival for Shavuot, celebrating the giving of the Torah at Mt. Sinai. Also referred to as the Harvest Festival, in ancient times Jewish farmers brought their first fruits of the season to the Temple in Jerusalem as offerings.